Inspired by the fruit and veggie sales hosted by Food4Good in the west end, the All Saints Cathedral located at 10035 103 Street has started its own discounted produce sale (an article about the market’s origins appear in The Messenger). The Manna Market takes place weekly on Wednesdays from 2-5pm – follow them on Twitter for updates. Colleen Heidecker of Colleen’s Chocolates will be leading wine and chocolate pairing sessions via Inspire YEG on November 29 and December 12, 2018 at Rebel Food and Drink. Tickets are $100. The next Swine & Dine event on November 29, 2018 will be hosted by Drift at their winter location, the Shamrock Curling Club. Tickets for the 4-course menu are $45. Meat Street Pies is returning to the City Market at City Hall to lead several gingerbread house workshops before Christmas. Kits are priced at $27 and dates include December 1, 8, and 15, 2018. Speaking of gingerbread houses, if building one isn’t up your alley, consider checking out the masterpieces created by the Hotel Macdonald and Duchess (in the shape of Hogwarts). The second annual Northern Lands Prairie Collective Holiday Market runs December 2, 2018 at the Prairie Gardens & Adventure Farm. In addition to local food vendors (including RGE RD), guests can tour a greenhouse, taste spirits, and enjoy roasted chestnuts. Lui-Chi’s Coffee has opened its storefront cafe on the main floor of the Phipps-Mckinnon Building at 10020 101A Avenue. They’re known for their whiskey barrel aged coffee; they also serve up Arno’s French Pastry. A second location of nut purveyor Mezos Roastery will be opening at Edmonton City Centre. Hopscotch, an Ontario-based chain of Freshii-type quick-serve restaurants, is opening several Edmonton locations, starting with an outlet at West Edmonton Mall. Bloom Cookie Company had to delay the opening of their 124 Street bakery – follow them on Twitter for the latest updates. The Hotel Macdonald has released their annual festive season brochure, with information about their popular teas and buffets. Vue Weekly announced that it will cease operations at the end of November. Like many other local writers, I also previously contributed to Vue, and have fond memories of the Dish section. It’s unfortunate, but hopefully food blogs and other media outlets that cover food can continue in its wake. The New York Bagel Cafe had to fend off some bad press this week after a customer posted a receipt that she had been charged $3.50 for lemon water. The contestants on The Great Canadian Baking Show shared their favourite local bakeries – all three Edmonton-area bakers chose Duchess. Sharon posted about her meal at a new fried chicken joint in the southside, Alberta Fried Chicken (1260 25 Avenue). Graham raved about the food served at Blowers & Grafton. The Journal reviewed the plant-based offerings of Kanu. Crystal wrote a pair of posts about Wilfred’s and Red Star Pub. Vue Weekly paid Nudoru a visit. Like Love Pizza, Seoul Fried Chicken will be starting its own delivery service after exhausting all other options. Linda shared this great piece in Thrillist about the unintended consequences of elevating some small restaurants to regional or national fame. 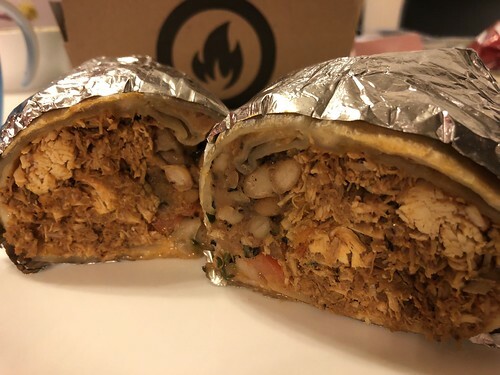 It’s a bit dangerous having Rostizado just down the street from us – and their delicious La Mision burritos just a few clicks away for take-out. Packed with meat, beans, and cheese, they’re a great deal at $12.50, via Foodora. © 2012 Only Here for the Food / Sharon Yeo.